Khwaja Ahmad Abbas (Urdu/Punjabi: خواجہ احمد عباس ; Hindi: ख़्वाजा अहमद अब्बास) (7 June 1914 – 1 June 1987), popularly known as K. A. Abbas, was an Indian film director, novelist, screenwriter, and a journalist in the Urdu, Hindi and English languages. His films won three National Film Awards in India, and the Palme d'Or (Grand Prize) at the Cannes Film Festival, with three Palme d'Or nominations. He was the maker of important Hindi films such as Saat Hindustani (1969) and Do Boond Pani (1972), both of which won the National Film Awards for Best Feature Film on National Integration, the Palme d'Or (Cannes Film Festival) nominated Pardesi (1957), and Shehar Aur Sapna (1963) which won the National Film Award for Best Feature Film. 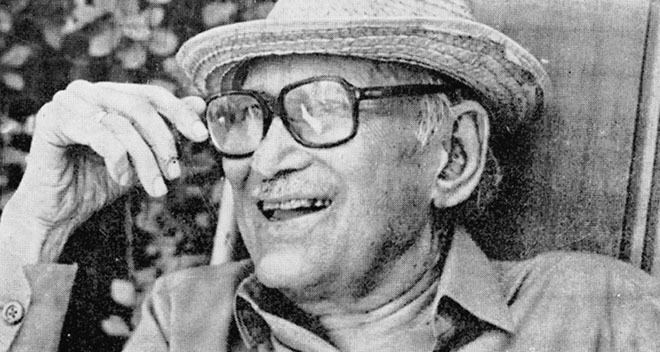 As a screenwriter, Khwaja Ahmad Abbas is considered one of pioneers of Indian parallel or neo-realistic cinema, having penned films like the Palme d'Or winner at the Cannes Film Festival, Neecha Nagar (1946), Jagte Raho, Dharti Ke Lal, Saat Hindustani, and Naya Sansar. He is known for writing the best of Raj Kapoor's films, including the Palme d'Or nominated Awaara (1951), as well as Shri 420, Mera Naam Joker, Bobby and Henna. His column ‘Last Page’, holds the distinction of being one of the longest-running columns in the history of Indian journalism. The column began in 1935, in Bombay Chronicle, and moved to the Blitz after the Chronicle's closure, where it continued until his death in 1987. He was awarded the Padma Shri in 1969, by Government of India. Khwaja Ahmad Abbas was born in Panipat, Haryana. He was born in the home of celebrated Urdu poet, 'Khwaja Altaf Husain Hali', a student of Mirza Ghalib. His grandfather Khwaja Gulam Abbas was one of the chief rebels of the 1857 Rebellion movement, and the first martyr of Panipat to be blown from the mouth of a cannon. Abbas's father Ghulam-Us-Sibtain graduated from Aligarh Muslim University, was a tutor of a prince and a prosperous businessman, who modernised the preparation of Unani medicines. Abbas's mother, 'Masroor Khatoon', was the daughter of Sajjad Husain, an enlightened educationist. Abbas took his early education in 'Hali Muslim High School', which was established by his great grand father Hali. He had his early education till 7th in Panipat. He was instructed to read the Arabic text of the Quran and his childhood dreams swung at the compulsive behest of his father. Abbas completed his matriculation at the age of fifteen. He did his B.A. with English literature in 1933 and LL.B. in 1935 from Aligarh Muslim University. 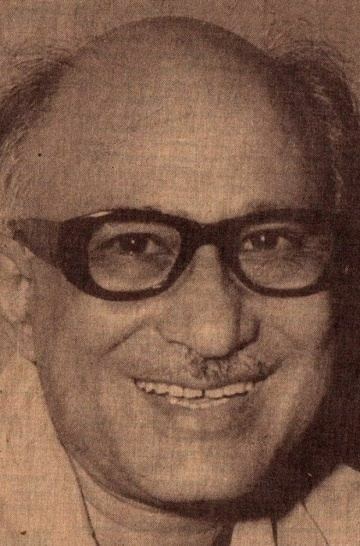 Abbas began his career as a journalist, when he joined 'National Call', a New Delhi based newspaper after finishing his B.A.. Later while studying law in 1934, started 'Aligarh Opinion', India's first university students' weekly during the pre-independence period. After completing his education at Aligarh Muslim University, Abbas joined the Bombay Chronicle in 1935. He occasionally served a film critic, but after the film critic of the paper died, he was made the editor of the film section. He entered films as a part-time publicist for Bombay Talkies in 1936, a production house owned by Himanshu Rai and Devika Rani, to whom he sold his first screenplay Naya Sansar (1941). While at the Bombay Chronicle, (1935–1947), he started a weekly column called 'Last Page', which he continued when he joined the Blitz magazine. "The Last Page", (‘Azad Kalam’ in the Urdu edition), thus became the longest-running political column in India's history (1935–87). A collection of these columns was later published as two books. He continued to write for The Blitz and Mirror till his last days. Meanwhile, he had started writing scripts for other directors, Neecha Nagar for Chetan Anand and Dr. Kotnis Ki Amar Kahani for V. Shantaram. In 1945, he made his directorial debut with a film based on the Bengal famine of 1943, Dharti Ke Lal (Children of the Earth) for the Indian People's Theatre Association (IPTA). In 1951, he founded his own production company called Naya Sansar, which consistently produced films that were socially relevant including, Anhonee, Munna, Rahi (1953), based on a Mulk Raj Anand story, was on the plight of workers on tea plantations, the National Film Award winner, Shehar Aur Sapna (1964) and Saat Hindustani (1969), which won the Nargis Dutt Award for Best Feature Film on National Integration and is also remembered as Bollywood icon, Amitabh Bachchan's debut film. A prolific writer, and novelist, during his illustrious career spanning five decades, Abbas wrote over 73 books in English, Hindi and Urdu. 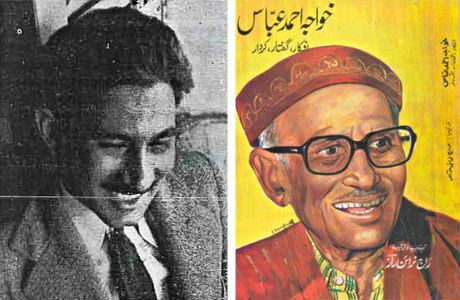 Abbas was considered a leading light of the Urdu short story. His best known fictional work remains 'Inquilab', based Communal violence, which made him a household name in Indian literature. Like Inquilab, many of his works were translated into many Indian, and foreign languages, like Russian, German, Italian, French and Arabic. Abbas interviewed several renowned personalities in literary and non-literary fields, including the Russian Prime Minister Khrushchov, American President Roosevelt, Charlie Chaplin, Mao-Tse-Tung and Yuri Gagarin. He went on to write scripts for Jagte Raho, and most of the prominent Raj Kapoor films including Awaara, Shri 420, Mera Naam Joker, Bobby and Henna. His autobiography, I Am not an Island: An Experiment in Autobiography, was first published in 1977 and later released in 2010. In 1968, Abbas made a documentary film called Char Shaher Ek Kahani (A Tale of Four Cities). The film depicted the contrast between the luxurious life of the rich in the four cities of Calcutta, Bombay, Madras and Delhi and that of the squalor and poverty of the poor. He approached the Central Board of Film Certification in order to obtain a 'U' (Unrestricted Public Exhibition) certificate. Abbas was however informed by the regional office of the Board that film was not eligible to be granted a 'U' certificate but was suitable for exhibition only for adults. His appeal to the revising committee of the Central Board of Film Certification led to the decision of the censors being upheld. Khwaja Ahmad Abbas further appealed to the Central Government but the government decided to grant the film a 'U' certificate provided certain scenes were cut. Following this, Abbas approached the Supreme Court of India by filing a writ petition under Article 32 of the Indian Constitution. He claimed that his fundamental right of free speech and expression was denied by the Central Government's refusal to grant the film a 'U' certificate. Abbas also challenged the constitutional validity of pre-censorship on films. However the Supreme Court of India upheld the constitutional validity pre-censorship on films. 1946: Wrote screenplay for Neecha Nagar, which became the only Indian film to win a Palme d'Or (Golden Palm) at the Cannes Film Festival. 1951: Wrote screenplay for Awaara, which was nominated for a Palme d'Or at the Cannes Film Festival. 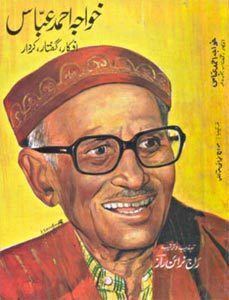 Vorosky Literary Award of the Soviet Union in 1984, Urdu Akademi Delhi Special Award 1984, Maharashtra State Urdu Akademi Award in 1985 and the Soviet Award for his contribution to the cause of Indo-Soviet Friendship in 1985. Outside India: The Adventures of a Roving Reporter, Hali Pub. House, Delhi, 1939. An Indian looks at America (The Rampart library of good reading), 1943. An Indian looks at America, Thacker, Bombay, 1943. Tomorrow is ours! A novel of the India of Today; Bombay, Popular Book Depot, 1943. "Let India fight for freedom", Bombay, Sound magazine (Publication dept. ), 1943. Defeat for death: A story without names, Padmaja Publications 1944. Invitation to Immortality: a one-act play, Bombay: Padma Pub., 1944. Not all Lies. Delhi: Rajkamal Pub., 1945. Cages of freedom and other stories, Bombay, Hind Kitabs Ltd., 1952. China can make it: Eye-witness account of the amazing industrial progress in new China, 1952. The Black sun and Other stories, Jaico Publishing House, 1963. Raat ki bahon mein, Hindi, Radhakr̥ishṇa Prakashan, 1965. Indira Gandhi; return of the red rose, Hind Pocket Books, New Delhi, 1966. Chabili, Hindi, Allahabad, Mitra Prakashan, 1968. Salma aur Samundar, Urdu/Hindi, New Delhi, Komala Pocket Books, 1969. Maria, Delhi, Hind Pocket Books, 1971. Teen Pahiye, Urdu/Hindi, Delhi, Rajpal & Sons, 1971. Jawaharlal Nehru: Portrait of an integrated Indian; New Delhi, NCERT, 1974. Distant dream, New Delhi, Sterling Pub., 1975. Barrister-at-law: A play about the early life of Mahatma Gandhi, New Delhi, Orient Paperbacks, 1977. I Am not an Island: An Experiment in Autobiography, New Delhi, 1977. Four Friends, Arnold-Heinemann, New Delhi, 1977. 20 March 1977: a day like any other day, Vikas Publishing House, New Delhi, 1978. Janata in a jam?, 1978. The Naxalites, Lok Publications, 1979. Bread, beauty, and revolution: being a chronological selection from the Last pages, 1947 to 1981, Marwah Publications, New Delhi, 1982. Nili Sari aur Doosri Kahaniyan̲, Urdu, Maktabah-e-Jamia, New Delhi, 1982. The gun and other stories, Arnold-Heinemann, New Delhi, 1985. The Thirteenth Victim, Amar Prakashan, 1986. Khwaja Ahmad Abbas; Vasant Sāthe; Suhail Akhtar (2010). The Dialogue of Awaara: Raj Kapoor's Immortal Classic. Vijay Jani, Nasreen Munni Kabir. Niyogi Books. ISBN 978-81-89738-54-9. Vasudev and Lenglet, eds., Indian Cinema Super-bazaar, Vikas, New Delhi, 1978. Dr. R.G. Mathapati, "Abbas: An Island"
Indian Film Culture (New Delhi), no. 4, September 1964. Film World, vol. 1, no. 10, October 1978. Ghish, S., "K. A. Abbas: A Man in Tune with History", Screen (Bombay), 19 June 1987. Obituary in Jump Cut (Berkeley, California), no. 33, February 1988. Abbas, Communicator of repute, The Dawn, 13 October 2002.